Discoveroo wooden baby play gym – you’ll love it too! Buying gifts for babies is one of those strange joys. We all love to put thought and care into choosing tiny things knowing full well that in most cases the baby doesn’t actually care what they are wearing, shaking or chewing. 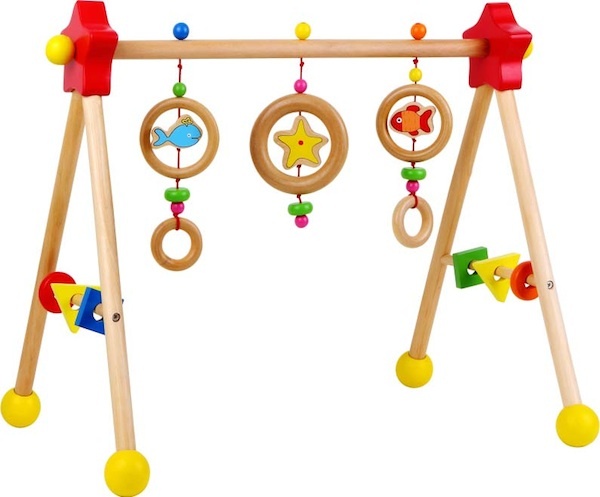 The Discoveroo Wooden Play Gym is one of those gifts that will please parents and tots. Parents will like that it isn’t plastic, the simple shapes and the fact that you can pick it up and sit it over the baby easily. Bubs will love the contrast between the primary colours and wood as well as all the bits and bobs to swipe at, twist and chew. Apart from the fact that it is wooden (my favourite type of toy) one of the most appealing factors for me is that, unlike a lot of play gyms, you can sit the gym over any blanket. This is great if you want to do nappy free lounging, keep baby occupied in a bouncer or rocker, or for just-after-milk playtime. You can grab it for $54.95 from Little Kiddies, with a flat $7 postage fee to anywhere in Australia. If you live in Sydney, they offer same day shipping!